MANY’S THE consumer warned off a deal that seems too good to be true. But aviation may be different. Consider the very cheap fares available on low-cost carriers. Ryanair, an Irish budget airline that is now Europe’s biggest, made its name in its early days selling tickets for just one penny (one cent). Although it no longer matches those prices, Ryanair does offer fares for £10 ($13) or less on many of its routes. And those prices are falling. On January 18th the company issued its second profit warning of recent months, signalling that overcapacity in Europe’s aviation market was dragging the fares down even farther than expected this winter. But its problems look far from severe. After all, the carrier still expects to make profits of €1bn-€1.1bn (€1.14- $1.25) this year, down from €1.1bn-€1.2bn. How do low-cost airlines make money with a business model predicated upon such cheap fares? In recent months Gulliver has bought several returns with Ryanair from London to Edinburgh or Dublin costing £30 or less. A colleague snagged a $99 single fare on Norwegian, one of Ryanair’s rivals, from Oakland, California, to London. Often the fares are lower than the air-passenger duty the government levies for each passenger, so the airline effectively subsidises each flyer. Instead of making its money from ticket fares, Ryanair has become Europe’s most profitable airline by charging for extras like hold luggage and priority boarding that may cost it nothing. And Ryanair has a lot of passengers to sell those tickets to. Michael O’Leary, the chief executive, says his planes are filled from Friday to Tuesday. On less popular flights, this means selling a lot of tickets in advance at a loss, rather than expensively at the last minute. Any losses sustained on the tickets can, in theory, be recouped from the profits generated by selling add-ons. 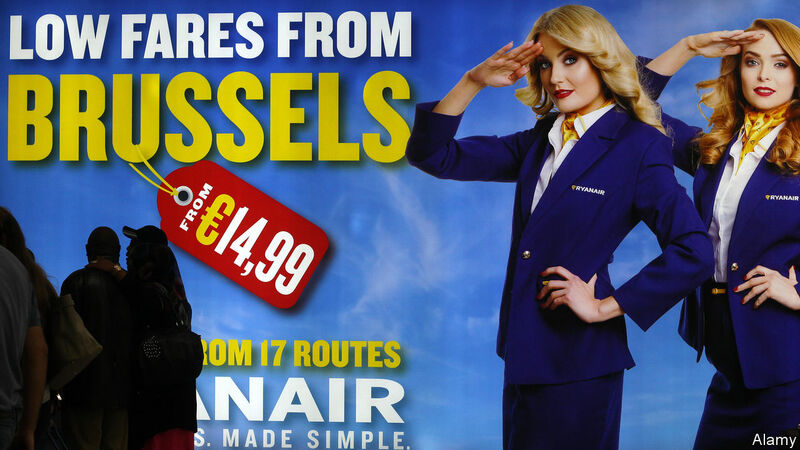 Ryanair’s business strategy has been adopted by its competitors. Low-cost carriers continue to cut fares while charging ever more for extras. One such airline, Wizz, from Hungary, has taken Ryanair’s model to an extreme. It now makes much more of its revenues from selling extras than from selling tickets (see chart). 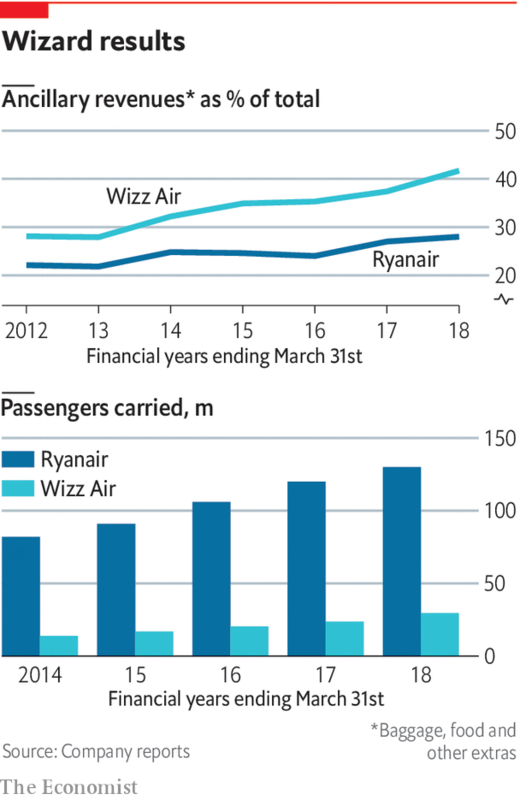 Wizz’s success has riled its Irish competitor into action: last November Ryanair copied Wizz’s policy of charging passengers for a second cabin-bag. There are limits to the low-fare business model. On long-haul routes budget airlines may struggle to sell enough cans of Coke and duty-free perfume to make up the money lost on cheap fares. Norwegian, a low-cost carrier that has tried to adopt Ryanair’s model for trans-Atlantic flights, is facing financial troubles. And the model’s success is not certain in poorer countries, where travellers will go to greater lengths to avoid paying for extras. This is one reason why short-haul airlines in India are losing money. But in the developed world, the Ryanair method is far from exhausted. Short-haul travellers should expect fares to become even cheaper, but be prepared to pay more, for more extras, too.